With a new theme, “obstruction of justice,” Attorney General Bill Barr has started his own takedown of President Donald J. Trump. Barr said today he would be releasing the Mueller Report with the names of key government officials, Congressmen, and future defendants blacked out. The Mueller Report was written by the Justice Department. It supplemented previous investigations of FBI informants. Will Barr’s investigation last two years like Special Prosecutor Robert Mueller’s did? Two more years will leapfrog next year’s Presidential election. Last week, Barr explained his reasons for another Trump probe. Robert Mueller is still investigating the President. Barr and Mueller are “best friends”. Mueller’s probe investigated alleged crimes made during the Trump Campaign for President. The Mueller Report has never intended to be made public. 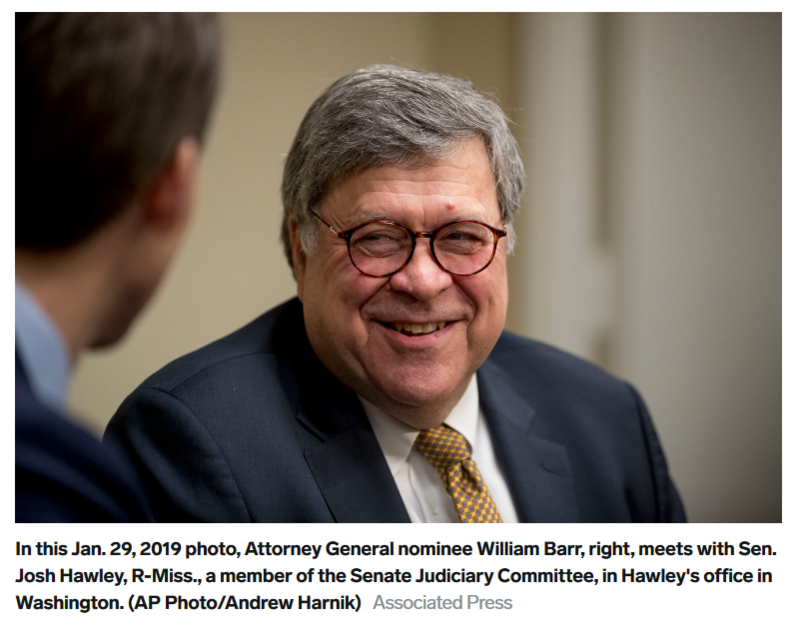 Barr also served as Attorney General (AG) for President George Bush from 1991 to 1993. Barr worked four years for the CIA from 1973 to 1977. George Bush was Director of the CIA from January 30, 1976, to January 20, 1977. As Attorney for the President, Barr was in the center of the Iran-Contra scandal. In it, the CIA was caught selling drugs to pay for weapons. Iran was supposed to get the weapons. Instead, they went to Nicaragua to pay for a war there. The Contras used drugs to pay for the guns. The scheme started when Ronald Reagan was President. Was Barr in on the cover-up? Or was he responsible for it? Barr denied Congress’ request for an independent investigation of the Iran-Contra scheme. The Bush Administration was accused of paying bribes with four billion dollars in fraudulent loans so Saddam Hussein could buy American-made weapons. Fourteen persons in President Bush’s administration were indicted. It included his Secretary of Defense Caspar Weinberger. Only one person, Howard Zinn, went to jail. Six were pardoned including Weinberger. The rest including Lt. Col. Oliver North had their guilty verdicts reversed on appeal. Barr advised President Bush on the pardons. Bush was President Ronald Reagan’s Vice President at the time of the scandal. Paul Erickson has admitted trading guns for drugs for the CIA since the 1980’s. The photo below is dated 1990. He was selling guns to the Contras. It is from his personal photo album posted on the internet. Erickson worked with Russian spy Mariia Butina and the NRA to takedown the Trump Campaign for President. Butina pleaded guilty to being a Russian spy. She is in jail awaiting sentencing. Erickson flunked out of the University of South Dakota. Yet he was graduated from Yale in 1984. How did Erickson get in? A recommendation from George Bush. He was Vice President from 1981 to 1989. Where did Bush go to college? Mark Tutt Lambert is the key whistleblower in the Uranium One scandal, according to George Webb. Webb’s YouTube Channel specializes in providing information on Uranium One. In the scandal, one-fourth of America’s uranium was sold to Russia for $147 million. The money was contributed to the Clinton Foundation. Lambert has been on probation since June 18th, 1992, according to Pacer, the official record of the federal court system. Lambert worked for the CIA with Peter Strzok in setting up Iran’s nuclear program. Strzok no longer works for the CIA or FBI. Lambert worked 20-years in uranium logistics, specializing in exporting U.S. weapons-grade uranium and centrifuges to Iran and Russia. He sold his business two years ago to start a distillery. He is going to trial in July on his second Uranium One case. Both Lambert and Strzok are fluent in Farsi, the language spoken in Iran. What has been AG Bill Barr’s role in keeping Lambert, Strzok, and Erickson out of jail? First criminal case against Mark Lambert dated June 18th, 1992. Case remains open. Marked as “pending”. Lambert released from prison on July 2nd, 1999. Mark Tutt Lambert is Lambert number two.